See Also, "What Disease was Akhen-Aton Suffering From"
Amenhotep IV-better known as Akhenaten, the new name he took early on in his reign-ushered in a revolutionary period in Egyptian history. 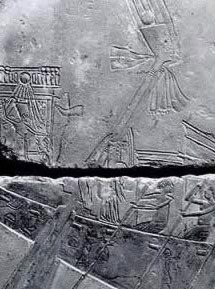 The Amarna Interlude, as it is often called, saw the removal of the seat of government to a short-lived new capital city, Akhetaten (modern el-Amarna), the introduction of a new art style, and the elevation of the cult of the sun disc, the Aten, to pre-eminent status in Egyptian religion. This last heresy in particular was to bring down on Akhenaten and his immediate successors the opprobrium of later kings. The young prince was at least the second son of Amenhotep III by his chief wife, Tiy: an elder brother, prince Tuthmosis, had died prematurely (strangely, a whip bearing his name was found in Tutankhamun's tomb). There is some controversy over whether or not the old king took his son into partnership on the throne in a co-regency there are quite strong arguments both for and against A point in favor of a co-regency is the appearance during the latter years of Amenhotep III's reign of artistic styles that are subsequently seen as part of the 'revolutionary' Amarna art introduced by Akhenaten; on the other hand, both 'traditional' and 'revolutionary' Art styles could easily have coexisted during the early years of Akhenaten's reign. At any rate, if there had been a co-regency, it would not have been for longer than the short period before the new king assumed his preferred name of Akhenaten ('Servant of the Aten') in Year 5. The beginning of Akhenaten's reign marked no great discontinuity with that of his predecessors. Not only was he crowned at Karnak (temple of the god Amun) but, like his father he married a lady of non-royal blood, Nefertiti, the daughter of the vizier Ay. Ay seems to have been a brother of Queen Tiy (Anen was another) and a son of Yuya and Tuya. Nefertiti's mother is not known; she may have died in childbirth or shortly afterwards, since Nefertiti seems to have been brought up by another wife of Ay named Tey, who would then be her stepmother. The tenth king of the 18th Dynasty was perhaps the most controversial because of his break with traditional religion. Some say that he was the most remarkable king to sit upon Egypts throne. There can be little doubt that the new king was far more of a thinker and philosopher than his forebears. Akhenaten was traditionally raised by his parents, Amenhotep III and Queen Tiy (1382-1344 B.C.) by worshipping Amen. Akhenaten, however, preferred Aten, the sun god that was worshipped in earlier times. Amenhotep III had recognized the growing power of the priesthood of Amun and had sought to curb it; his son was to take the matter a lot further by introducing a new monotheistic cult of sun-worship that was incarnate in the sun's disc, the Aten. When early in his reign he changed his name to Akhenaten, meaning He Who is of Service to Aten, he also renamed his queen to Nefer-Nefru-Aten, which is Beautiful is the Beauty of Aten. This was not in itself a new idea: as a relatively minor aspect of the sun god Re-Harakhte, the Aten had been venerated in the Old Kingdom and a large scarab of Akhenaten's grandfather Tuthmosis IV (now in the British Museum) has a text that mentions the Aten. Rather, Akhenaten's innovation was to worship the Aten in its own right. Portrayed as a solar disc whose protective rays terminated in hands holding the ankh hieroglyph for life, the Aten was accessible only to Akhenaten, thereby obviating the need for an intermediate priesthood. At first, the king built a temple to his god Aten immediately outside the east gate of the temple of Amun at Karnak, but clearly the coexistence of the two cults could not last. He therefore proscribed the cult of Amun, closed the god's temples, took over the revenues. He then sent his officials around to destroy Amens statues and to desecrate the worship sites. These actions were so contrary to the traditional that opposition arose against him. The estates of the great temples of Thebes, Memphis and Heliopolis reverted to the throne. Corruption grew out of the mismanagement of such large levies. To make a complete break, in Year 6 the king and his queen, left Thebes behind and moved to a new capital in Middle Egypt, half way between Memphis and Thebes. It was a virgin site, not previously dedicated to any other god or goddess, and he named it Akhetaten-The Horizon of the Aten. Today the site is known as el-Amarna. In the tomb of Ay, the chief minister of Akhenaten (and later to become king after Tutankhamun's death), occurs the longest and best rendition of a composition known as the 'Hymn to the Aten', said to have been written by Akhenaten himself. Quite moving in itself as a piece of poetry, its similarity to, and possible source of the concept in, Psalm 104 has long been noted. No longer did the dead call upon Osiris to guide them through the after-world, for only through their adherence to the king and his intercession on their behalf could they hope to live beyond the grave. According to present evidence, however, it appears that it was only the upper echelons of society which embraced the new religion with any fervor (and perhaps that was only skin deep). Excavations at Amarna have indicated that even here the old way of religion continued among the ordinary people. On a wider scale, throughout Egypt, the new cult does not seem to have had much effect at a common level except, of course, in dismantling the priesthood and closing the temples; but then the ordinary populace had had little to do with the religious establishment anyway, except on the high days and holidays when the god's statue would be carried in procession from the sanctuary outside the great temple walls. The standard bureaucracy continued its endeavors to run the country while the king courted his god. Cracks in the Egyptian empire may have begun to appear in the later years of the reign of Amenhotep III; at any rate they became more evident as Akhenaten increasingly left government and diplomats to their own devices. Civil and military authority came under two strong characters: Ay, who held the title 'Father of the God' (and was probably Akhenaten's father-in-law), and the general Horemheb (also Ay's son-in-law since he married Ay's daughter Mutnodjme, sister of Nefertiti). Both men were to become pharaoh before the 18th Dynasty ended.This redoubtable pair of closely related high officials no doubt kept everything under control in a discreet manner while Akhenaten pursued his own philosophical and religious interests. It is evident from the art of the Amarna period that the court officially emulated the king's unusual physical characteristics. Thus individuals such as the young princesses are endowed with elongated skulls and excessive adiposity, while Bek-the Chief Sculptor and Master of Works-portrays himself in the likeness of his king with pendulous breasts and protruding stomach. On a stele now in Berlin Bek states that he was taught by His Majesty and that the court sculptors were instructed to represent what they saw. The result is a realism that breaks away from the rigid formality of earlier official depictions, although naturalism is very evident in earlier, unofficial art. The power behind the throne? Although the famous bust of Nefertiti in Berlin, the queen is not subject to quite the same extremes as others in Amarna art, by virtue of being elegantly female.Indeed, there are several curious aspects of Nefertiti's representations. In the early years of Akhenaten's reign, for instance, Nefertiti was an unusually prominent figure in official art, dominating the scenes carved on blocks of the temple to the Aten at Karnak. One such block shows her in the age-old warlike posture of pharaoh grasping captives by the hair and smiting them with a mace hardly the epitome of the peaceful queen and mother of six daughters. Nefertiti evidently played a far more prominent part in her husband's rule than was the norm. 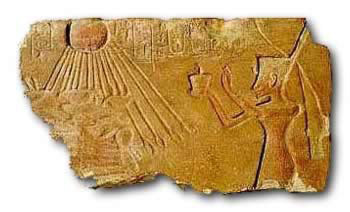 The sandstone building slab (talatat) shows Akhenaten wearing the Red Crown and offering to the Aten's disk, whose descending rays extend the Ankh sign of life to him. Private collection Tragedy seems to have struck the royal family in about Year 12 with the death in childbirth of Nefertiti's second daughter, Mekytaten; it is probably she who is shown in a relief in the royal tomb with her grief-stricken parents beside her supine body, and a nurse standing nearby holding a baby. The father of the infant was possibly Akhenaten, since he is also known to have married two other daughters, Merytaten (not to be confused with Mekytaten) and Akhesenpaaten (later to become Tutankhamun's wife). Nefertiti appears to have died soon after Year 12, although some suggest that she was disgraced because her name was replaced in several instances by that of her daughter Merytaten, who succeeded her as 'Great Royal Wife'. The latter bore a daughter called Merytaten-tasherit (Merytaten the Younger), also possibly fathered by Akhenaten. Merytaten was to become the wife of Smenkhkare, Akhenaten's brief successor. Nefertiti was buried in the royal tomb at Amarna, judging by the evidence of a fragment of an alabaster ushabti figure bearing her cartouche found there in the early 1930s. Akhenaten died c. 1334, probably in his 16th reignal year.Evidence found by Professor Geoffrey Martin during re-excavation of the royal tomb at Amarna showed that blocking had been put in place in the burial chamber, suggesting that Akhenaten was buried there initially. Others do not believe that the tomb was used, however, in view of the heavily smashed fragments of his sarcophagus and canopic jars recovered from it, and also the shattered examples of his ushabtis-found not only in the area of the tomb but also by Petrie in the city. Amongst the distinctly 18th Dynasty jewelry found cached outside the Royal Tomb at Amarna the small gold ring with Nefertiti cartouche is particularly significant. What is almost certain is that his body did not remain at Amarna. A burnt mummy seen outside the royal tomb in the 1880s, and associated with jewelry from the tomb (including a small gold finger ring with Nefertiti's cartouche, was probably Coptic, as was other jewelry nearby. Akhenaten's adherents would not have left his body to be despoiled by his enemies once his death and the return to orthodoxy unleashed a backlash of destruction. They would have taken it to a place of safety and where better to hide it than in the old royal burial ground at Thebes where enemies would never dream of seeking it? It has been suggested that he was buried in tomb KV55, though other possibilities are also likely.